“Unexpected”. That was the comment our editor made when he read vibrunazo’s story on reddit. We’re sharing the story now with you also. Enjoy! Vibrunazo, a brazilian Pokémon GO player, noticed that a lot of the new Ingress Portals in his area did not convert into Pokéstops and decided not to let it go. After reporting and reviewing a lot of portals via OPR, Vibrunazo was confused as to why none of them became Pokéstops and was convinced that a bug is preventing the conversion. Now hold on a minute! We know what you’re thinking — “not all Ingress Portals become Pokéstops / Gyms” — and you are absolutely correct, but we’re not talking about a few portals here, we’re talking about 35 different portals in Brazil that weren’t converted. Why is Brazil significant for the story? Well, Brazil is known for its Portal/Pokéstop scarcity and traditionally a high percentage of Ingress Portals do become Pokéstops. 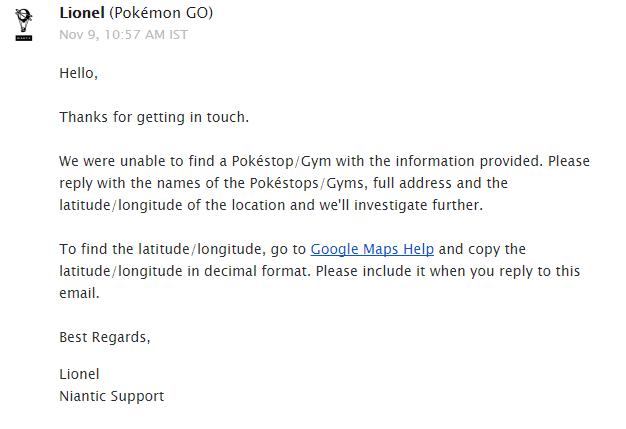 Niantic support replied me asking for more details about the missing Portals. He specifically asked for names and coordinates of the Pokéstops. So I replied with names, coordinates and full URL of the Ingress Intel for 2 out of the 35 Portals. Explained those were only 2 examples, I could give him more if needed. In a nutshell, one persistent Brazilian has managed to get himself 30 new Pokéstops by creating an honest bug report and backing up his claims with proof. Maybe we should all start playing Ingress, eh? The post Brazilian player manages to get 30 new Pokéstops by contacting Niantic support appeared first on Pokemon GO Hub.